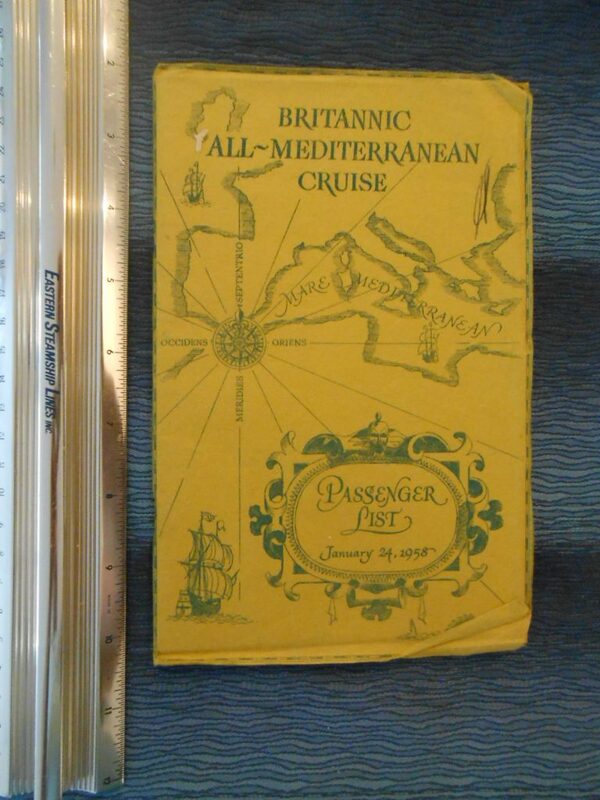 Lovely Passenger list for the Med cruise that began on 1/1/24 1958. 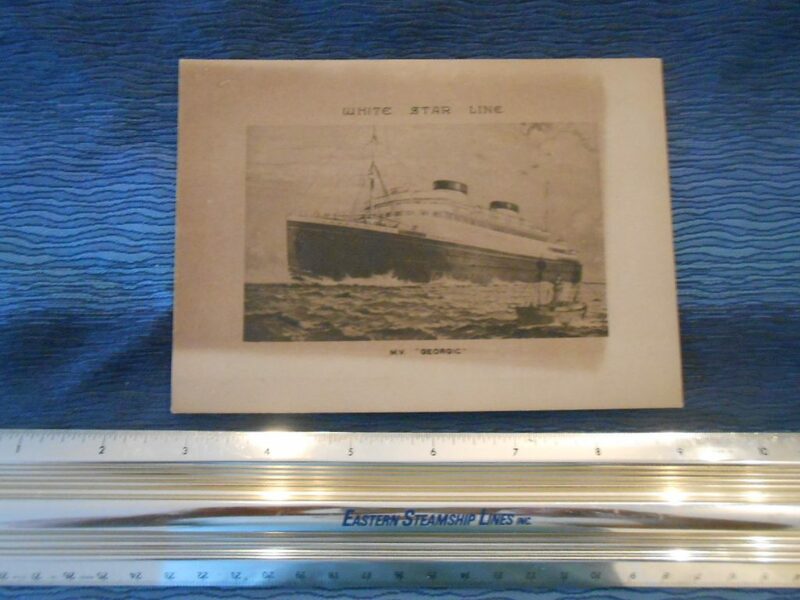 By this time, the Britannic was winding down her time in the post war fleet and would only be around a few more years … The Last of the White Star fleet. There are a few notations and scribblings inside … all extra history! The yellow covers seem to be made from a fiber-ous construction paper. 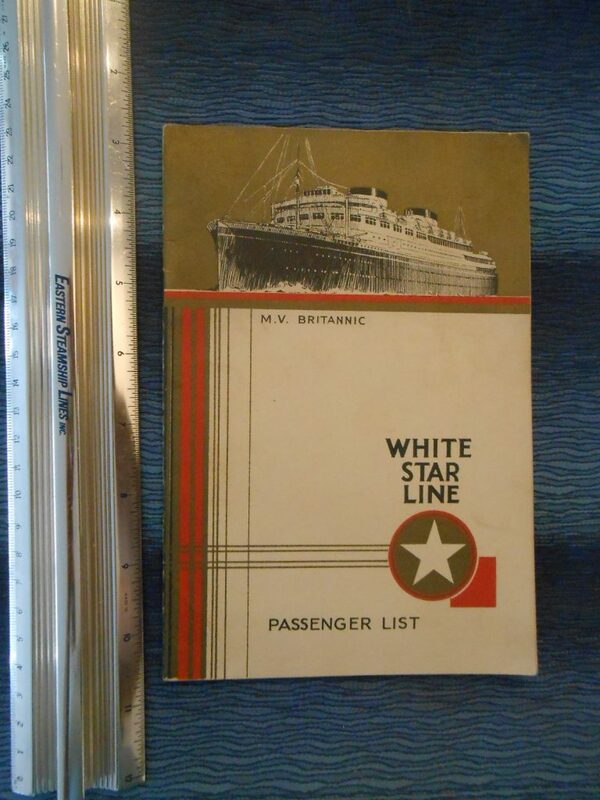 Excellent cover graphic on the Passenger List dated August 24, 1931. I love the subtle coloring and the gold accents. This mini cruise to Nova Scotia would have been a great depression way to gain revenue and serve thirsty Americans beyond the 3 mile limit. Some yellowing and bumps. 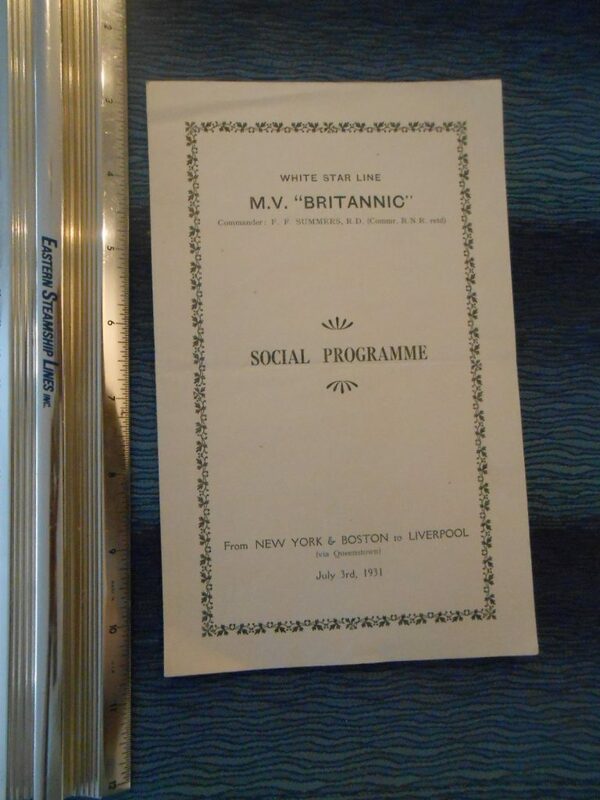 WSL: Cream Colored MV Britannic Social Program July 3rd 1931. 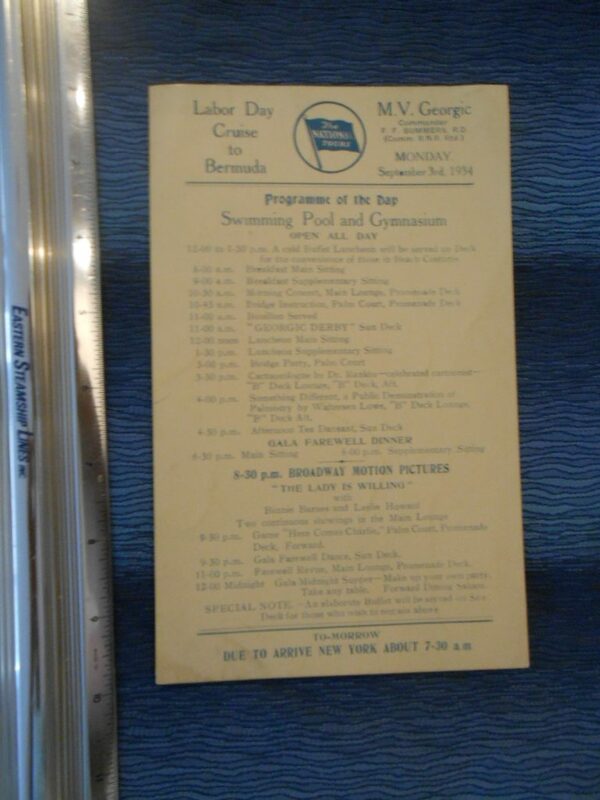 Great program listing the proposed events for the crossing from NYC as well as who the sponsors for the events would be… dated July 3rd 1931. 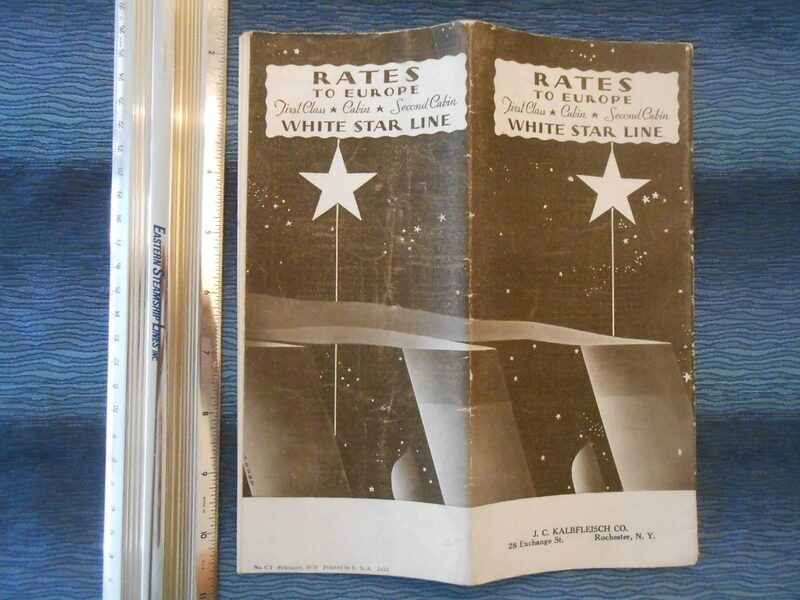 Great little group of 3menus and a first sitting dining card for a voyage in late July and early August 1931. The Menu edges do shows some yellowing, edge chipping and wear. The table card is for table 9 and seat 63. WSL: 1930 Rates to Europe deluxe folder. Not your typical rate folder … this one seems to list all ships in details for First , Cabin and Second cabin fares. Probably my favorite WSL art deco -streamlines cover graphic by Loewy … this image also was used in many magazine ads of the day. Some scuffs… but not common to find. 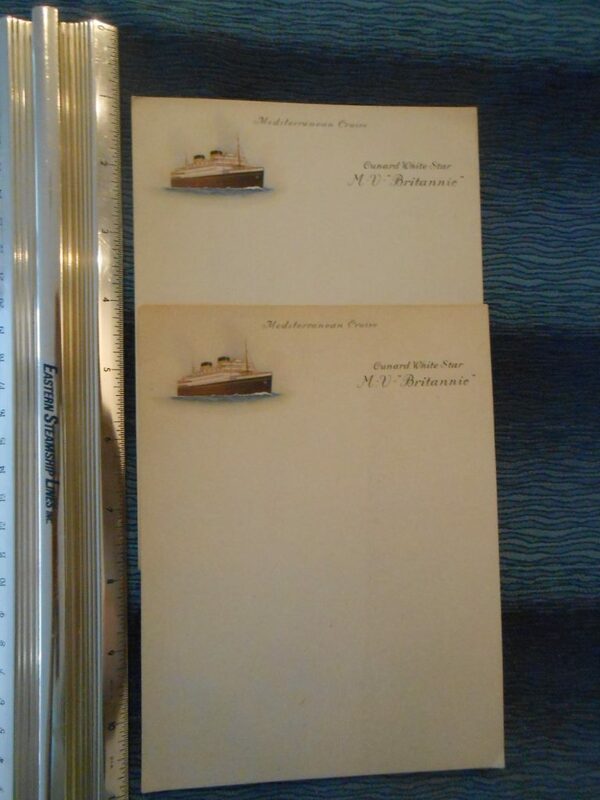 2 great little sheets of onboard writing paper … stamped specifically for a Mediterranean Cruise. These have yellowed .. but the ship graphic is still sharp and the colors have not altered. 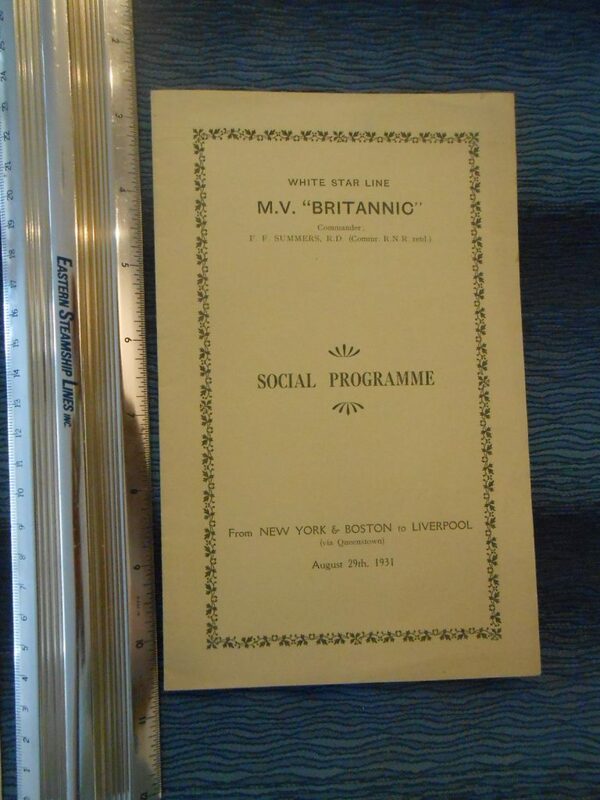 WSL: MV Britannic Social Program August 29th 1931. Great program listing the proposed events for the crossing and well as who the sponsors for the events would be… dated 8/29/31. 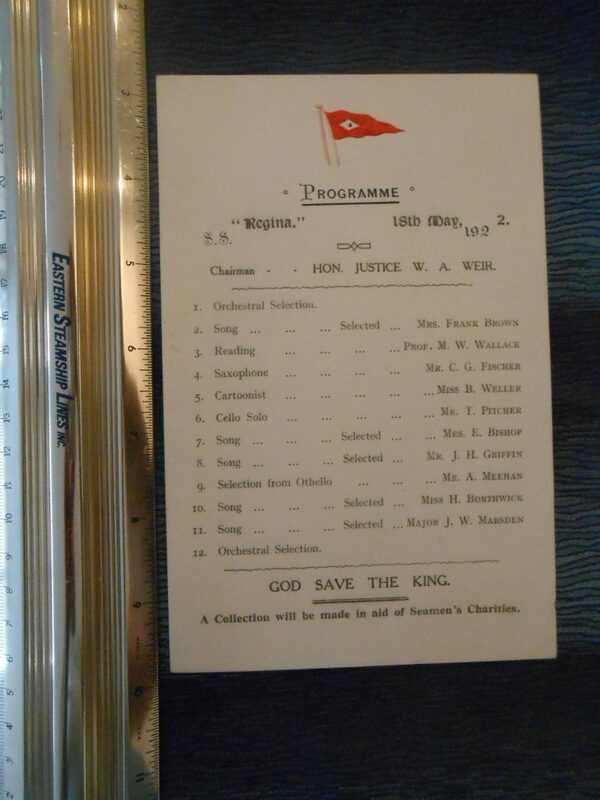 Cunard WSL: Georgic National Tours Daily Program 9/3/1934. Great list of the daily events for the National Tour Cruise taking place. The swimming pool and Gym were open all day and the movie “The Lady Is Willing” was shown at 830 in the Main Lounge. Interesting log abstract for WSL’s last vessel the great MV Georgic. 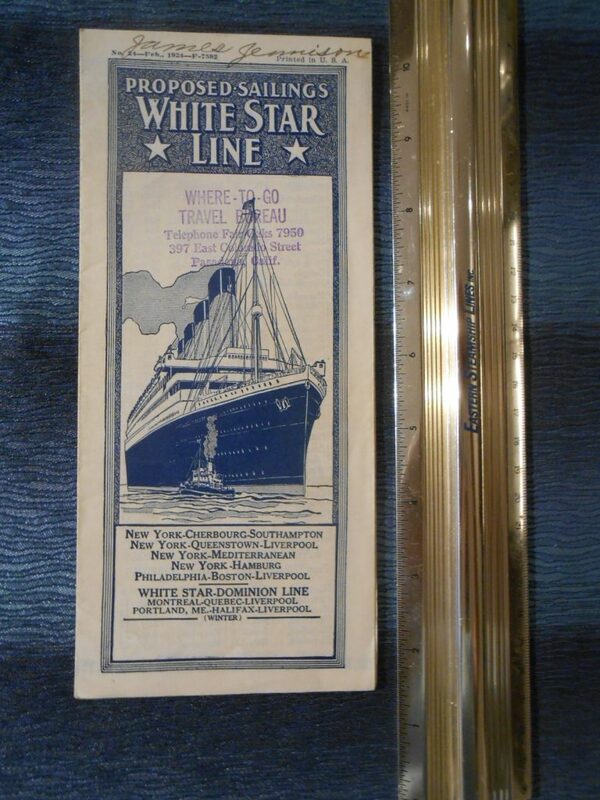 The is for a West Indies cruise from Valentine’s Day thru March 2nd 1934. This does show some browning and fading. Simple little program for the entertainment on May 18 1922. The Honorable Justice W.A Weir was the event sponsor for the 12 different entertainment selections. Great program listing the various events scheduled throughout the October 1929 voyage. 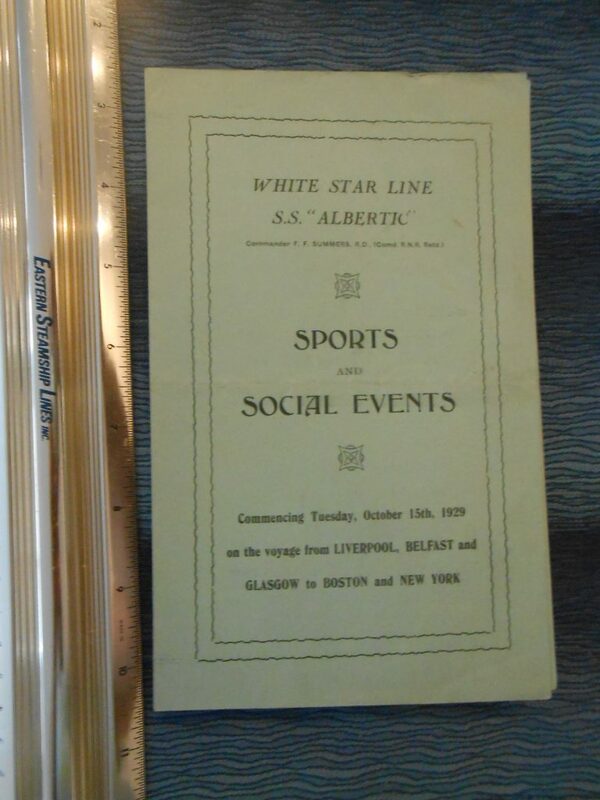 Great little program card dot the athletic events to be held on deck 9/13/1932. All competitors were requested to wear Bathing costumes in readiness. 7 events ranging from Potato Races to Tug of War. 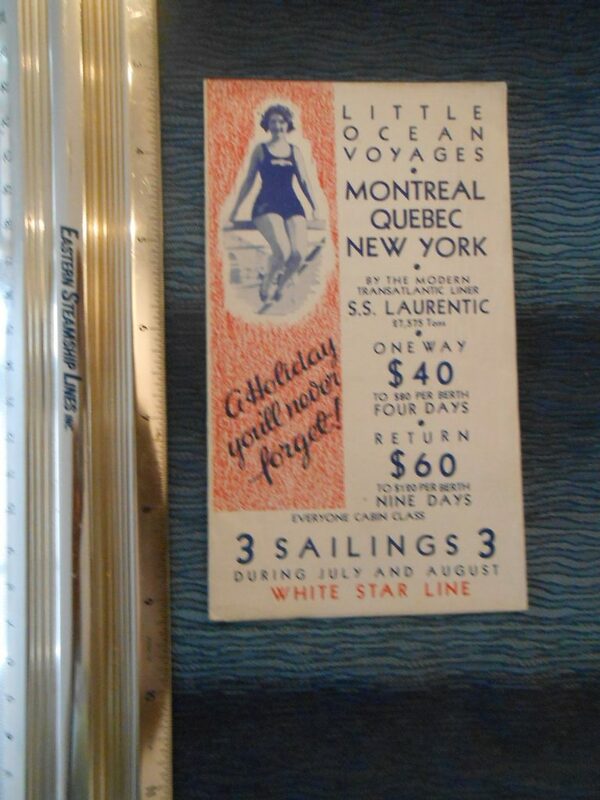 Great fold out for the lovely little Lauren tic … for a series of 3 summertime cruises from either NYC or Montreal. From the graphics I’d date this in the very late 20’s or early 30’s … there is not date I can see. Greta graphics and R/W/B coloring. 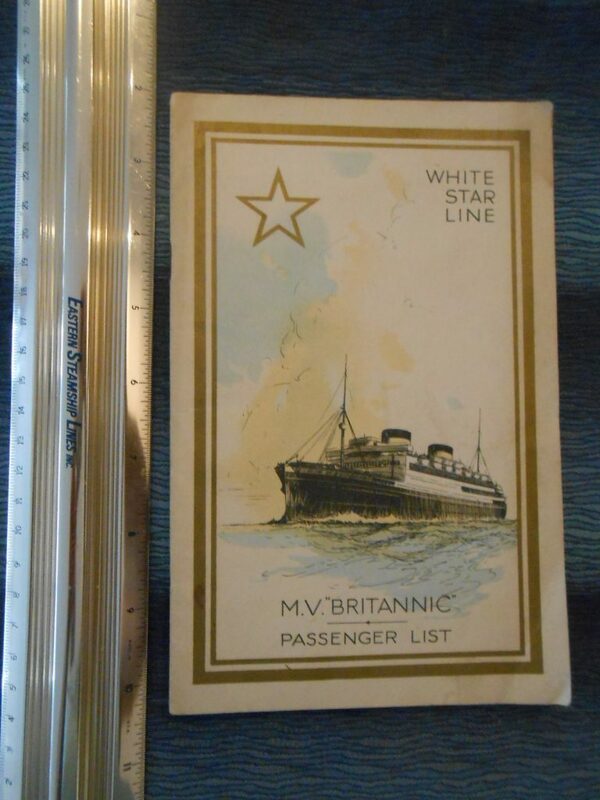 Nice little log card for an 8 day voyage in July of 1903, Interestingly … the cover shows the Oceanic of 1899 instead of the little Cymric herself. 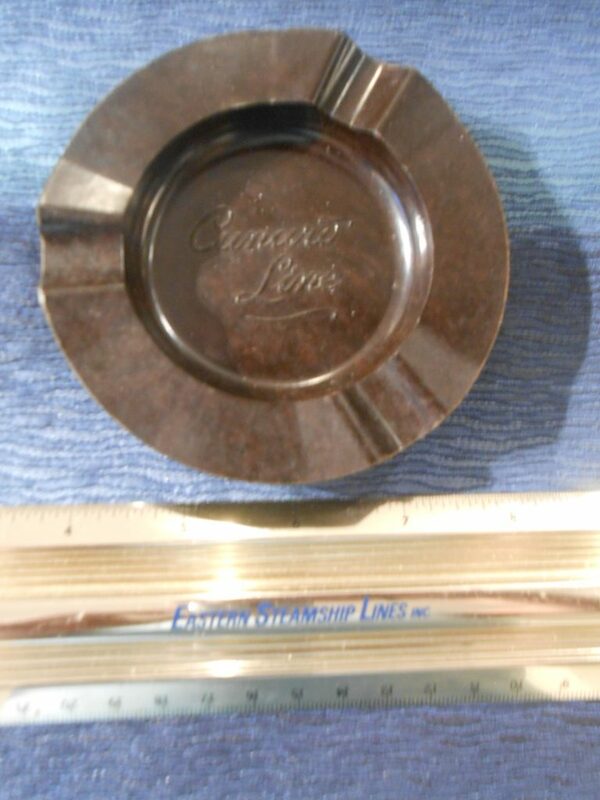 Great little bakelite ashtray from any fleet vessel in the 1950’s. Made by the Fraser glass company. In good shape with onboard typical use. 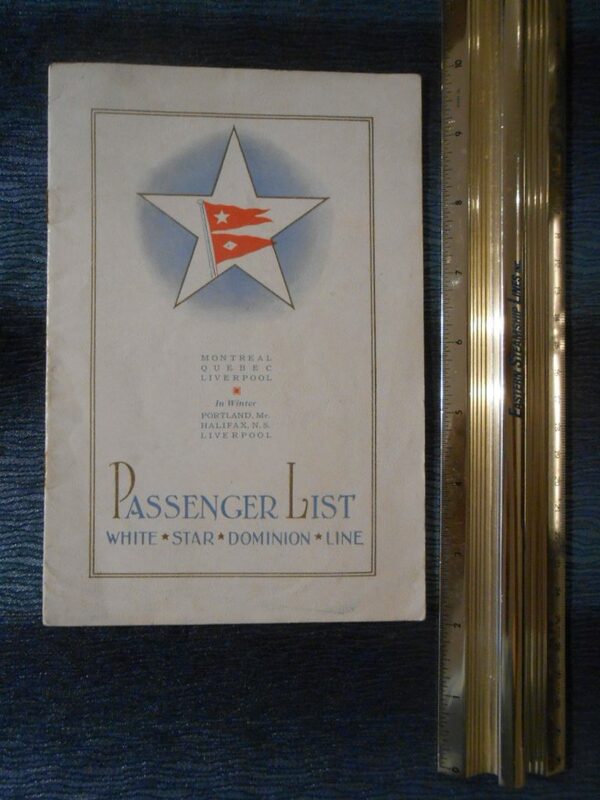 Lovely Passenger list for the RMS Canada ship Managed by the Dominion Line. This is a List of Cabin Passengers dated September 24th, 1921. Interesting this also mentions the Regina as completing and the Doric as building. Unusual item! 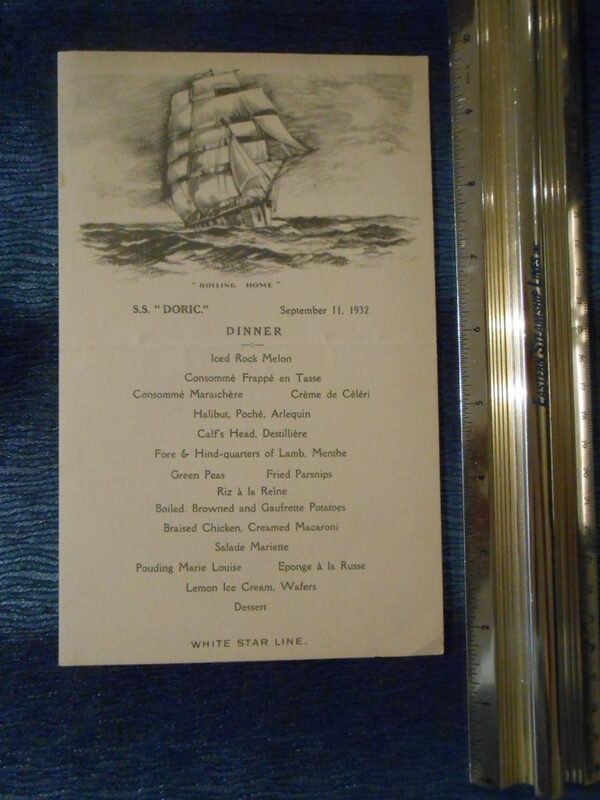 Nice dinner menu dated 9-11-32. Lots of great items … though my favorite would have been the Lemon Ice cream with wafers. 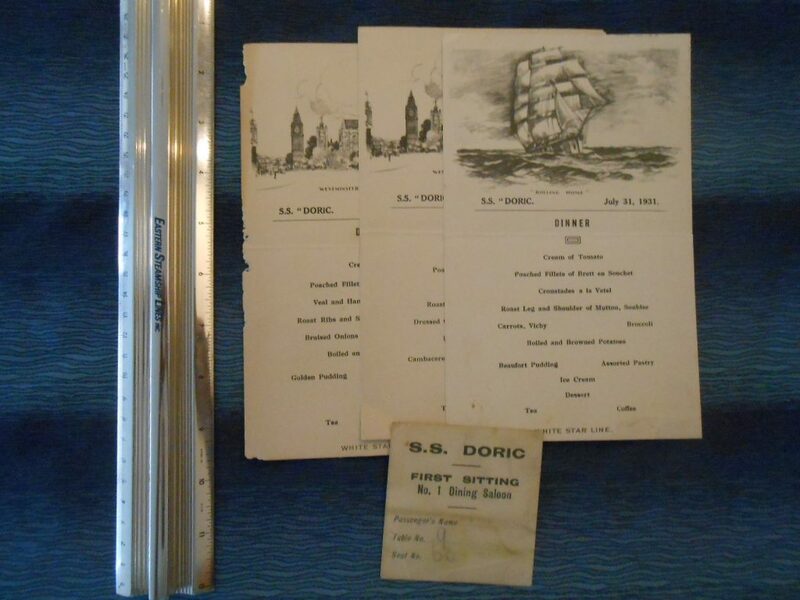 Nice sailing ship “Rolling Home” sketch show at the top of the menu. This has been folded. 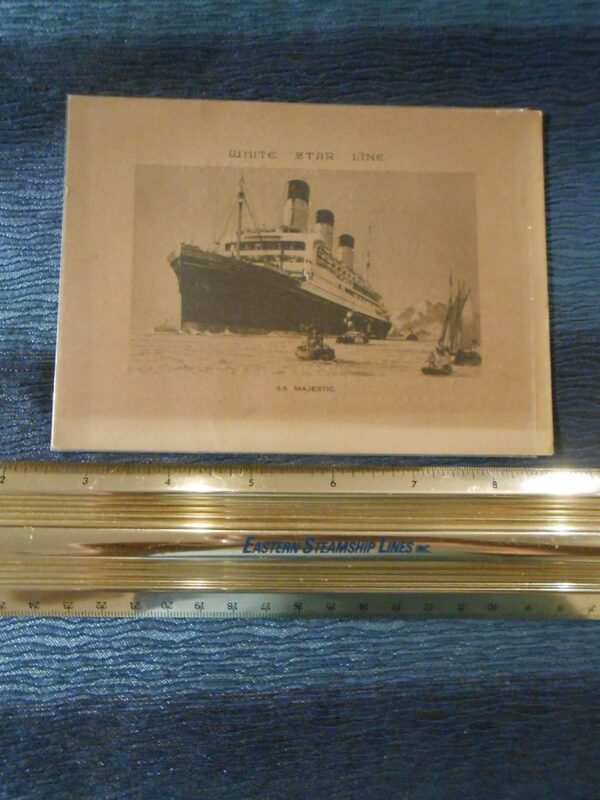 Looks like Proposed sailings folder was published in Feb 1924. 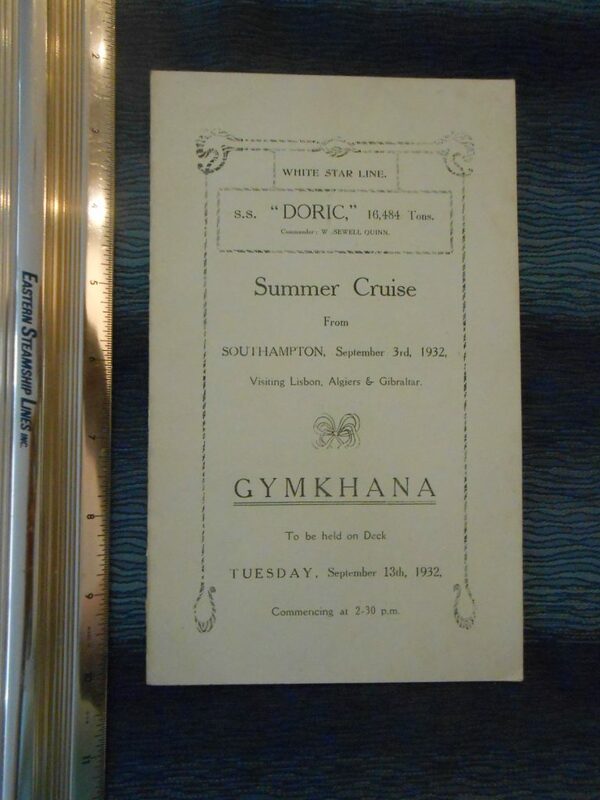 This covers several routs including sailings from NYC, Philadelphia and Canada to Southampton, Liverpool Hamburg .Interestingly, the first 2 voyages for the Majestic and Homeric are crossed out… wonder why? Nice Olympic drawings on the cover. A little writing on the cover. 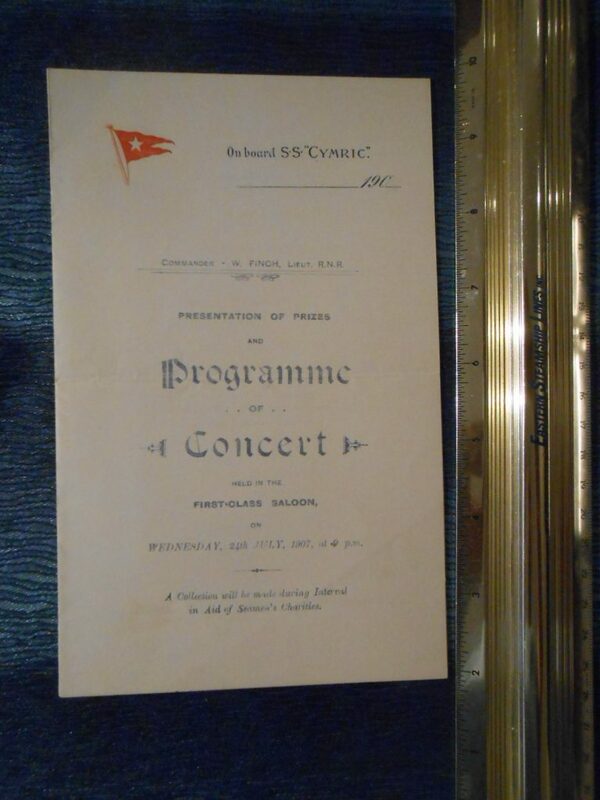 Nice Concert and activity program for the little Cymric dates July 24th 1907. It long slike there were 6 musical selections followed by a presentation of onboard Sports awards. Interestingly, this was printed on onboard writing room stationery. Nice embossed WSL flag.Unusual! 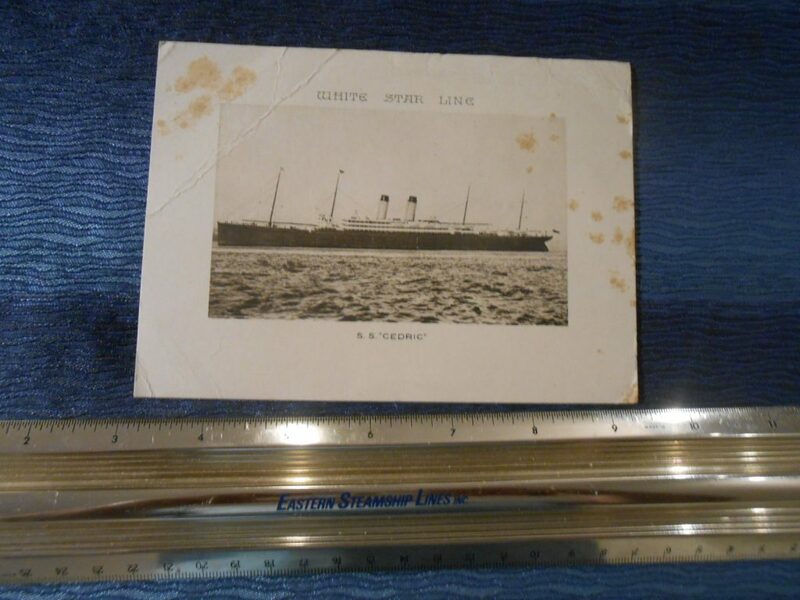 Nice Log card for the RMS Cedric Dated 1927. 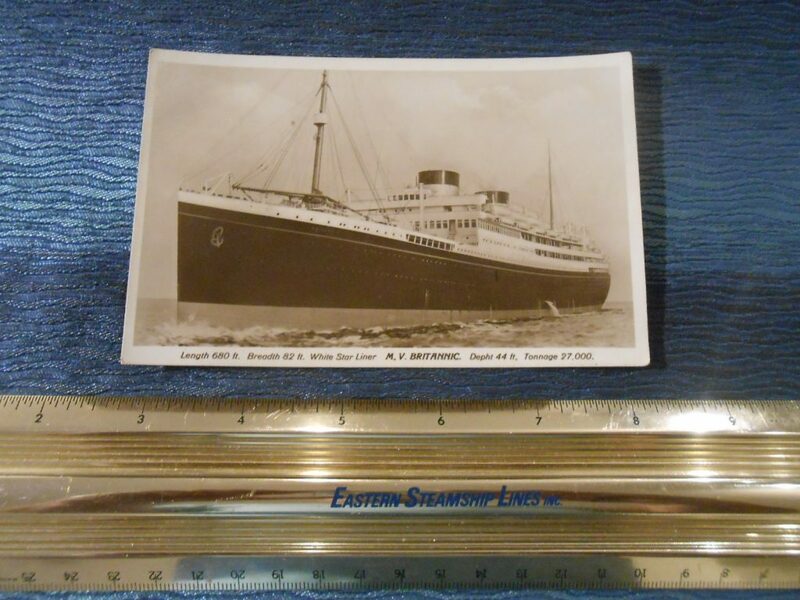 She left Boston on 12/18, spent Christmas at sea and arrived in Liverpool on 12/26/1927. Her average speed was 15/72 Knots. There is some spotting and browning to the log card. 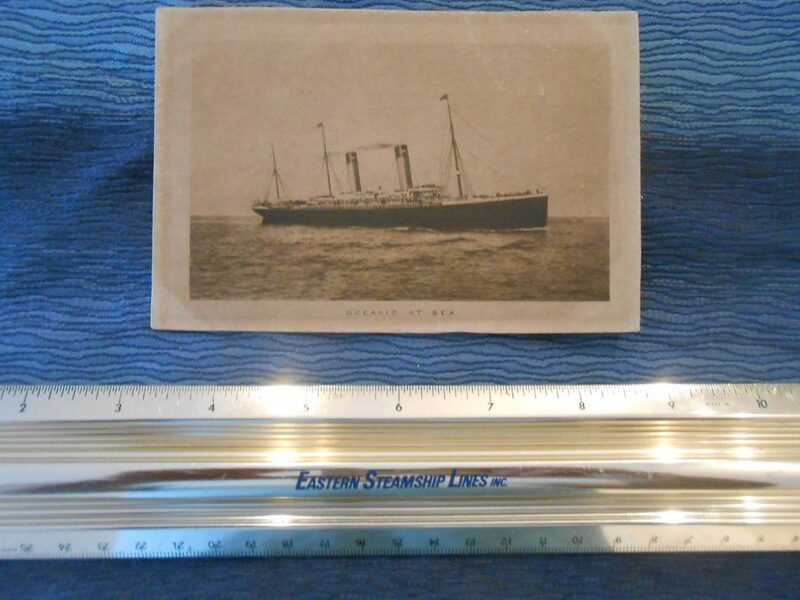 Love portrait post card for the stout MV Britannic. She was the next to the last new build for the WSL and lasted into 1960. Great Image! Nice WSL Majestic Log card dates Aug 30 – Sep 4,1934. It looks like the last days run was her best: 592 miles. She averaged 23.16 knots. In nice yet darkened and aged condition. 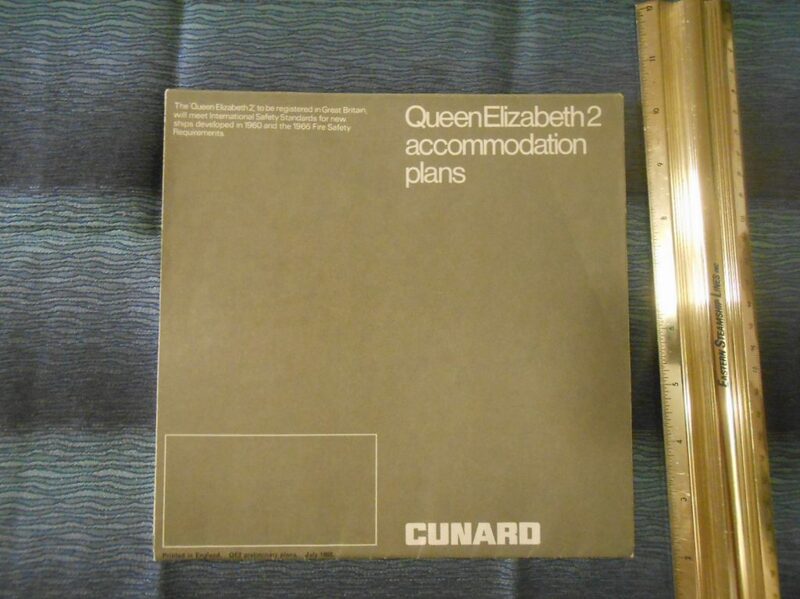 A very nice set of Preliminary plans for the Flagship … the world was awaiting with baited breath for her to make her debut when these were printed. Great condition … these have only been unfolded a few times as far as I can tell. 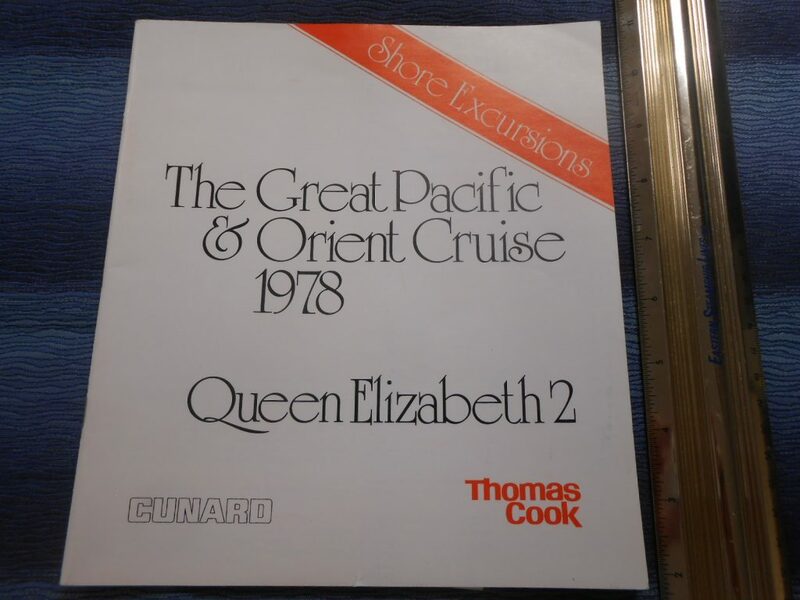 Cunard Line: QE2 Shore Excursion Manual for the 1978 Great Pacific Cruise via Thomas Cook. What a magnificent cruise this must have been … starting jan16th from NYC and Arrive back there on April 16th ..3 months of QE2 bliss! You would have started through the Panama Canal on Jan 24th and returned through on April 4th after your Pacific Adventure! Great condition.